NaNoWriMoTown is the Detroit, MI region of National Novel Writing Month (NaNoWriMo). The NaNoWriMo challenge is to write a 50,000 words novel in the 30 days of November. At the kick off party in 2014, the NaNoWriMoTown municipal liaisons (MLs) lamented that their button maker broke. NaNoWriMoTown provided pinback buttons to event attendees as prizes. 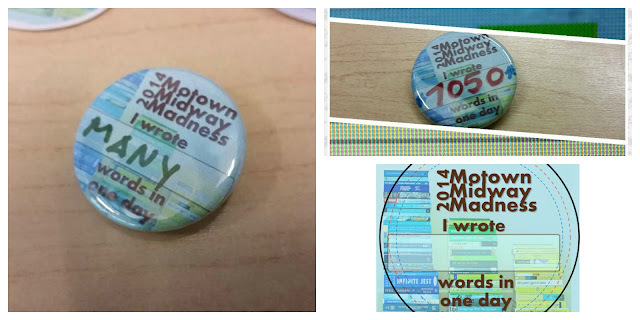 They also provided buttons to help attendees of the Midway Madness event document how many words they wrote that day. A chart is provided and attendees kept track of their progress with stickers. 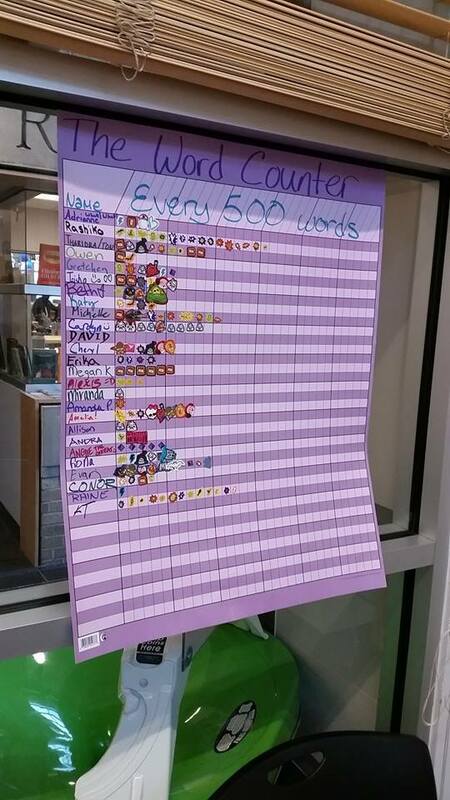 A sticker is placed on the chart for every 500 words written during the event. The attendees wouldn't be able to take the chart home with them. They could take a picture of thier progress but it wouldn't be the same as a physical button. Since NaNoWriMoTown was without a button maker that year, the head ML and I collaborated to ensure that the attendees wouldn't be without this important souvenir. NaNoWriMoTown provided the image they wanted to use. I provided a digital proof for approval. It was perfect! I pre-cut the design ahead of time and brought them with me to the Midway Madness event. When the event was over, attendees came to me for their custom button. They wrote down their word counts on the pre-cut design and I punched the button in front of them. It was a huge hit! One attendee, Angie Khalaf, took her custom button and made it into an image to document her progress. Way to go, Angie! Photos by Angie Khalaf - used with permission.